This is a soupy stew/salad mix- very flexible and forgiving and easy- canned or dried black beans with avocado, tomatoes,green beans,cabbage , tortilla chips and cheese! Make the tomato salsa- mix chopped tomatoes, diced red pepper, diced red onion, add 2 red wine vinegar to taste, salt and pepper, sliced green chilli. 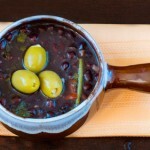 Cuban black beans( Moros y Christianos) 4.3 out of 5 based on 3 ratings.